About the Book : The Oath of the Vayuputras is the final book of the Shiva Trilogy. In the earlier books of the trilogy, Shiva finds out that the Nagas are not his enemies and joins hands with them to reach the root of all evil. This book will have answers to ‘the Neelkanth’s’ questions about his fate, the choices he made previously and karma. Further, in the concluding book of the trilogy, Shiva reaches Panchavati, the capital of Naga where he will come face to face with his greatest enemy. Will he win the battle over his wicked enemies, who are out to destroy him and his legacy? The Oath of the Vayuputras will also reveal the reason of Shiva’s close friend Brahaspati’s disappearance and reappearance at the end of the second book, The Secret of the Nagas. Further the relationship between Daksha, the king of Meluha and the mysterious temple priests will also be exposed in this last part of the trilogy. Shiva seeks helps from the Vayuputras in the quest to conquer all evil. The great warrior will encounter the real intentions of some characters he deemed to be close to him. Some new characters will add that extra vitality to the entire plot, especially Shiva’s greatest enemy whose name sends shivers down the spines of many great warriors. 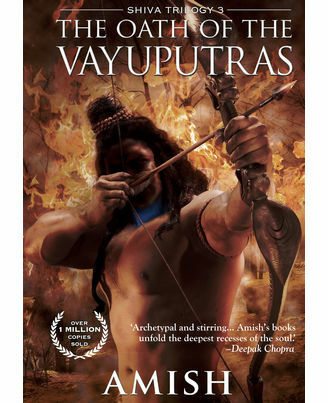 An interesting journey of a warrior who is turned into a God by his followers because of his deeds and war against the evil, this book is sure to have its readers’ full attention. A good read which will make one reflect on their actions, this book like the two earlier books of the trilogy focuses on philosophy, religion and the never ending battle between the good and the evil. 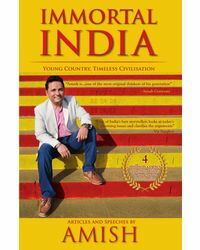 About the Author : Amish Tripathi, is an author who gave up his banking job to live his dream of becoming a writer. He is an IIM (Kolkata) graduate and worked for 14 years in the financial services industry. He has penned down three books as part of the Shiva Trilogy 3, which have received raving reviews and critical appreciation. His style of writing is fresh and has given birth to a new era of literature in India. 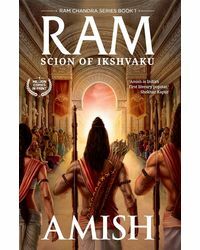 With philosophy, religion, karma and myth as his main areas of focus, Amish has weaved his plots around them and conquered the hearts of many readers with his riveting ideas. Amish lives with his wife Preethi and son Neel in Mumbai. As is evident from his books, Amish has a passion for religion, philosophy, mythology and history.